Very difficult parkour map specifically for the latest version of MCPE, where you have to make all your efforts and try to pass at least the first level. In general, everything here is very simple and there is no need to explain the rules. 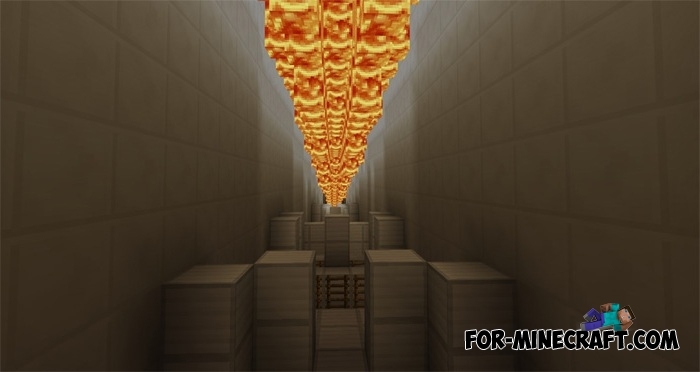 After the spawn, you will find yourself in a small tunnel, the top is made of deadly lava. To start the game you need to run forward as quickly as possible and reach the end of the tunnel. But it's not as easy as you think. There is a countdown (you have half a minute) after which the lava fall down and destroy all life. But after passing the first level, you get to the more difficult the second one. Invite a friend or play directly during the lesson. It is really fun and very difficult at the same time. How to install the Lava Escape map? Download the map and start the game.